Instant Pots have become hugely popular over the years because they ingeniously combine so many features into one appliance. While officially categorized as an electric pressure cooker, it's actually a 7-in-1 programmable cooker with the functions of a pressure cooker, slow cooker, rice cooker, steamer, saute, yogurt maker and warmer -- all in one appliance! They also feature built-in smart programs so with one push of a button, you can simply and easily make a pot of stew or keep some slow cooker food warm. With its slim design, it takes up very little counter space, making it the ideal appliance for everyone from students and condo dwellers to RV enthusiasts. Once again, Marilyn brings her extensive and creative recipe development skills to the forefront with these deliciously convenient meal ideas which truly make the most of an Instant Pot's capabilities. The recipes are handily categorized by appliance feature which makes meal preparation an organized and stress free event. And there are recipes for every meal and occasion from hearty breakfasts to main courses fit for entertaining. Country Bacon, Eggs and Hash Brown Casserole, Spicy Chipotle Beef Brisket and Tortillas, Mediterranean Chickpea and Lentil Salad, Tex-Mex Black Bean Dip, Peppermint Bark Pretzels, Rocky Road Chocolate Cake, Lemon Spoon Cake. 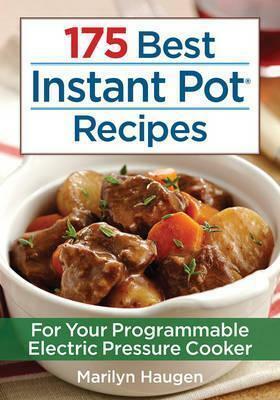 This outstanding collection of recipes created especially for use with an Instant Pot will inspire you to create meals for every occasion.